AICO introduces the stately majesty of the Excelsior collection of fine furniture. 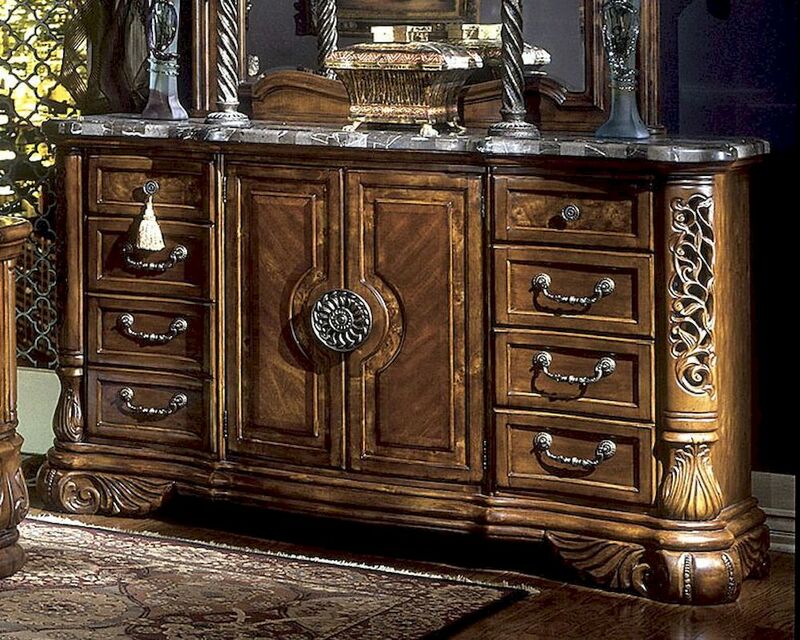 As part of the Michael Amini® Original Furniture Designs, this noble line features finery that rivals expensive antiques. Excelsior is carefully constructed using Birch solids and cherry veneers that are all bathed in a warm Fruitwood finish and all merge together with intricate carvings, old-world craftsmanship, and modern convenience to signify a posh lifestyle. Like AICO's other collections, the hidden extras truly add value to this exquisite line. Excelsior comes from the Latin word meaning "lordly," and as such makes a statement in any home. With its illuminated base, the Mansion Bed creates a look that is not found elsewhere, and makes the piece that much more special to the layout of the bedroom. When combined with the other available bed pieces, a room is created that could be found in any noble castle. Crafted with Birch solids, Cherry veneers. Bed has hinged, illuminated base.